MT. 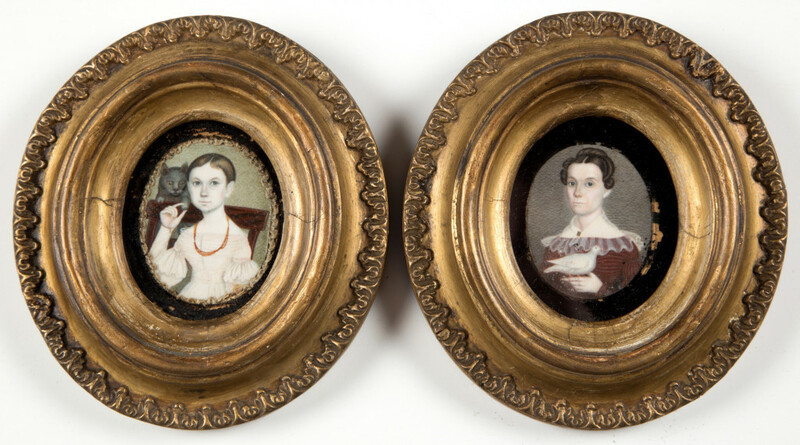 CRAWFORD, VA. — On November 11, day two of Jeffrey S. Evans and Associates’ two-day Americana and fine antiques auction, a pair of American school (Nineteenth Century) folk art miniature watercolor portraits—exceptional depictions of a mother and daughter— sold for $64,350 to one of five phone bidders, a NYC private collector; the underbidder was in house. The daughter is shown with a painted tablet-top side chair with a gray cat perched on the back, the mother is holding a white dove. They are identified verso as Mary Jane Mason and Emma Harris Mason, said to be members of a Dauphin Country, Penn., family, circa 1830. Each is housed under glass in a period oval gilt frame retaining its period printed “J.W. Sargeant” framer’s label verso, possibly with the original poplar backboard. Each portrait is 2 1/8 by 1¾ inches. The price includes the buyer’s premium. There will be a full review in a future issue. For further information, www.jeffreysevans.com or 540-434-3939.